Moong Dal Halwa: Moong dal halwa is a classic recipe that is relished throughout Rajasthan during the winter months, as it is supposed to keep the body warm and protect it from the bitter winter cold. It is considered to be auspicious, and is often prepared during Holi, Diwali and weddings too. Although it takes a lot of time to prepare moong dal halwa, the outcome is worth every minute of extra effort. Soak the moong dal or mung lentils, in enough water for 4 to 5 hours or overnight. Drain and grind the moong dal to a smooth paste with 1/4 cup water. Melt ghee in a non-stick pan, over medium heat. Add the ground moong dal paste. Keep on stirring the paste on a low to medium flame. Stir the paste till it transforms from pasty to lumpy (break the lumps while stirring) and then starts breaking down and separated with the fat releasing from the sides. Meanwhile in another pan or kadai, add milk, water and sugar, over medium heat. Stir so that the sugar dissolves. Heat this milk-water-sugar mixture till it comes to a boil. Add the transformed moong dal to the boiled milk. The mixture sizzles, so be careful. Simmer and cook stirring often till the liquid is absorbed and ghee starts separating from the mixture. Add in the cardamom powder and mix well. Moong dal halwa is ready to be served. Share the moong dal halwa into desired shaprs. Serve hot moong dal halwa, garnished with saffron stands, sliced almonds, raisins and cashews. You can make a larger quantity of this recipe and store it refrigerated for several weeks. Just add a little milk to the halwa before reheating it. 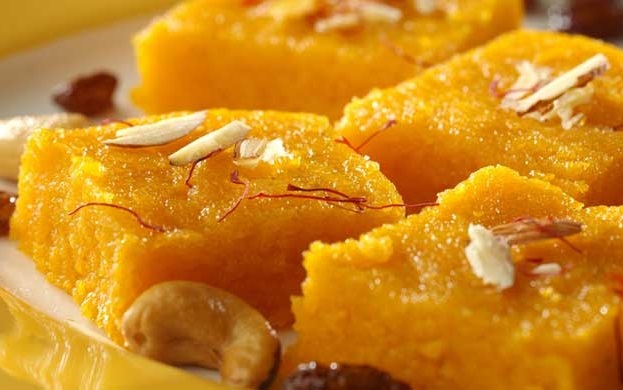 If you have any queries about this Moong Dal Halwa Recipe , please write down in comment box below.